Mock Draft Tracker: Who Will The Seahawks Pick at No. 21? With the 2018 season in the books and the NFL Scouting Combine coming up later this month, we’re are now into mock-draft season. Over the next two and a half months between now and the 2019 draft, we’ll periodically take a look at what various draft experts think the Seahawks might do with the 21st overall pick. It’s worth pointing out that few mock drafts include trades, especially this early in the process, so these predictions don’t take into account the very real possibility that the Seahawks, who currently hold only four picks, could end up moving back in the first round to add more picks. Analysis: With most of the top edge rushers off the board, Seattle gets a dominant force for their interior defensive line. Analysis: Mullen, a good value here, brings needed depth to the Seahawks’ secondary, especially if Justin Coleman leaves as a free agent. Analysis: The Seahawks have a decent linebacker stable, but they could use an edge rusher. Polite recorded 11 sacks for the Gators last season, showing speed and slipperiness coming around the corner. Analysis: How about this: Ximines is going to be the first prospect from Old Dominion to be picked in the NFL draft. Seriously: Check it out. He is an explosive pass-rusher -- 12 sacks in 2018 -- who has the versatility to play with his hand in the dirt or standing up on the edge. His game reminds me a little bit of DeMarcus Ware's, though Ximines has a ways to go. Pete Carroll is always looking for pass-rushers, and the Seahawks could lose Frank Clark in free agency. Analysis: Adderley possesses the range and ball-skills Pete Carroll has preferred at free safety and is gifted enough to potentially handle nickelback duties, as well. Analysis: Frank Clark is a pending free agent and even if he comes back they need more help rushing the passer. Ferrell has that look of a Seahawks edge rusher. Also at CBS Sports, Chris Trapasso has Seattle picking Florida State defensive end Brian Barns, Ryan Wilson mocks University of Washington free safety Taylor Rapp to Seattle, while R.J. White goes with Delaware free safety Nasir Adderley. Analysis: The top safety on the board comes off as Alabama free safety Deionte Thompson slides into Earl Thomas' old roster spot. Thompson isn't Thomas, but not many safeties are. He does have excellent range and instincts over the top, even if Clemson's passing game gave him some fits in the national title game. Thompson shouldn't be judged on one outing, especially when the rest of his 2018 film was dominant. If there is a valid concern, it's that he looks very skinny on film, but an NFL weight program can bulk him up. Analysis: There is a need on the (defensive) line and there are just a plethora of disruptive options. Analysis: Allen keeps climbing draft boards as evaluators realize he can be a productive pro player against both run and pass, no matter the position and no matter the scheme. The Seahawks have Frank Clark at one edge, and Allen can be a terrific complement with his ability to slide and play tackle on rushing downs. He has many of the inside-outside qualities of Michael Bennett, only in a bigger frame (6-5, 284 pounds). Analysis: Polite was one of the nation’s biggest breakout players, ranking fourth in both overall grade (91.0) and pass-rush grade (91.4). Seattle must replenish a pass-rush that has regressed on an annual basis in recent years. 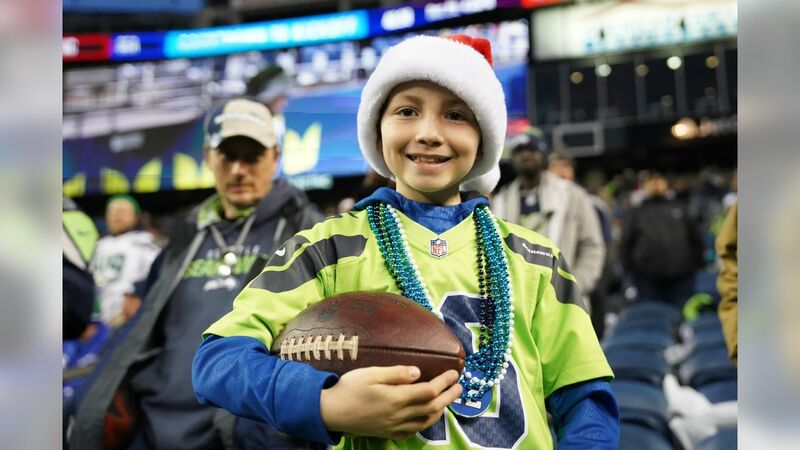 12s were loud and proud at the stadium for the wild-card playoff game. 12s celebrated in the stands as the Seahawks moved into field goal position on the final drive. 12s made themselves see and heard during the Wild-Card playoff game in Dallas.